The Australia scrum has collapsed but they had the ball out in time to keep their movement alive. At times it looked as though Scotland had no chance against Australia in their quarter final game Sunday in the Rugby World Cup, allowing an Aussie try at just over eight minutes into the match. Adam Ashley-Cooper took the offload from Tevita Kuridrani, who broke two tackles, and went in untouched for the five points. But that seemed to energize the Scots as they came roaring back, picked up three points on a penalty by Australia’s Scott Farley for playing while off his feet. Laidlaw added another three on a penalty to give the Scots a 13-5 lead. Then Australia woke up, took steady possession and worked the ball down to within five yards out with their forwards. That drew in the Scot defense and when the ball came out to the backs there was a overlap and an opportunity for Drew Mitchell to score a try in the opposite corner. 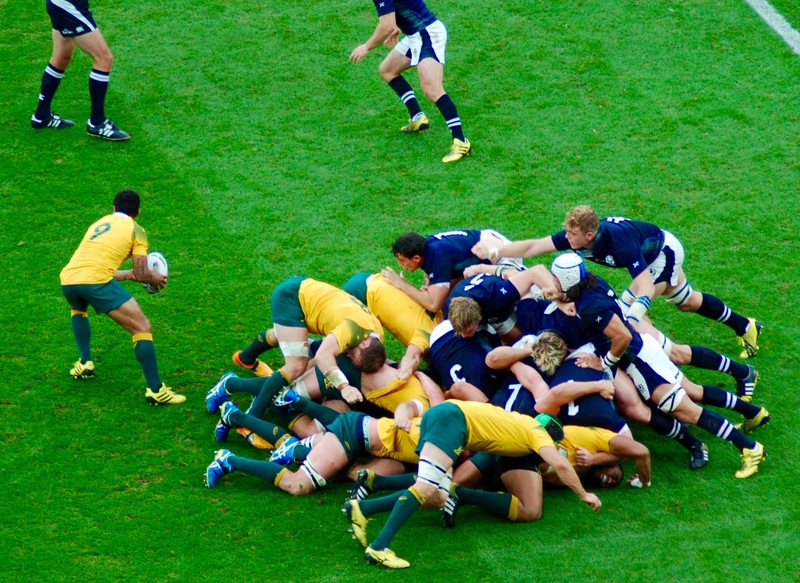 No conversion, and Australia settled in behind Scotland 13-10. Laidlaw added another penalty kick for Scotland, 16-10, and then Australia got the last say in the half when Scotland was called for illegal scrummaging. The Wallabies passed on the chance for a penalty and instead kicked to touch. They won the lineout, and their rolling maul put Michael Hooper over for the try. Scotland led at half 16-15.